Congratulations to William Frost-Foster in Year 8, who is currently competing in the Sydney Indoor Bouldering series, supervised by Sport Climbing Australia, and recently achieved first placing in his age group at an event held at Climbfit, Sydney. 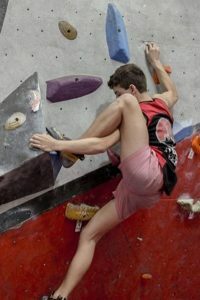 Will is currently leading the Sydney Indoor Bouldering series for his age group, with two first places, a second and third placing, with one event to go in December which will decide the series. An outstanding achievement William, we wish you well in December.